The “Uzi” model bullhorn, useful for certain musicians and Punk Archaeology un-conferences. 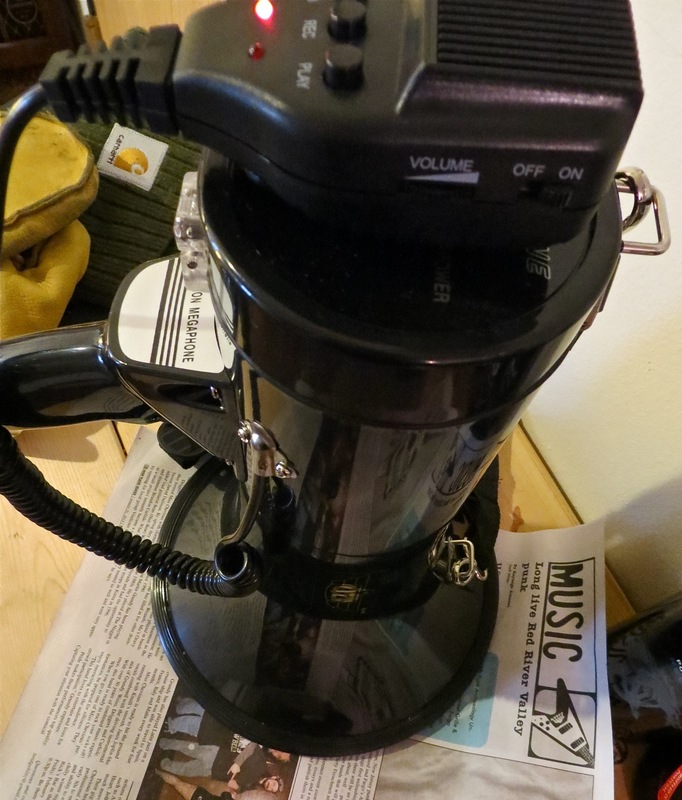 There has been light to medium-heavy banter about a bullhorn showing up at this Saturday’s Punk Archaeology formally unformal un-conference (Sidestreet Grille & Bar, Saturday at 7:17pm, downtown Fargo, North Dakota). So I thought I’d post a pic of the “Uzi” model bullhorn, perhaps one of the best bullhorns I’ve ever owned or appropriated for music and, now, an un-conference (I have been through 3 bullhorns thus far). I haven’t yet been able to test the full range of this particular bullhorn — I don’t mind using a bullhorn or drumset in my apartment, but my neighbors and landlord sure do. So we may have to experiment a bit with it this Saturday evening during the sound check. And here is at least one tip for potential bullhorn owners: bullhorns are a lot like drumsets in that everyone should own at least one. But never leave a bullhorn or drumset out at get-togethers or soirées. The bullhorn is much like a drumset in that someone will always invite themselves to sit down behind it to show everyone what they are made of. The first 3 seconds are kind of fun: whispering through a full-throttle bullhorn for your friend to get another beverage from the fridge has a certain charm the first time. But after about 4-to-7 seconds it goes from being annoying to being intolerable. So hide the bullhorns and drumsets before the company arrives. Everyone will thank you, as will your apartment neighbors. This entry was posted on Thursday, January 31st, 2013 at 4:44 pm	and tagged with Bullhorns, Drumsets, Punk Archaeology and posted in Uncategorized. You can follow any responses to this entry through the RSS 2.0 feed.